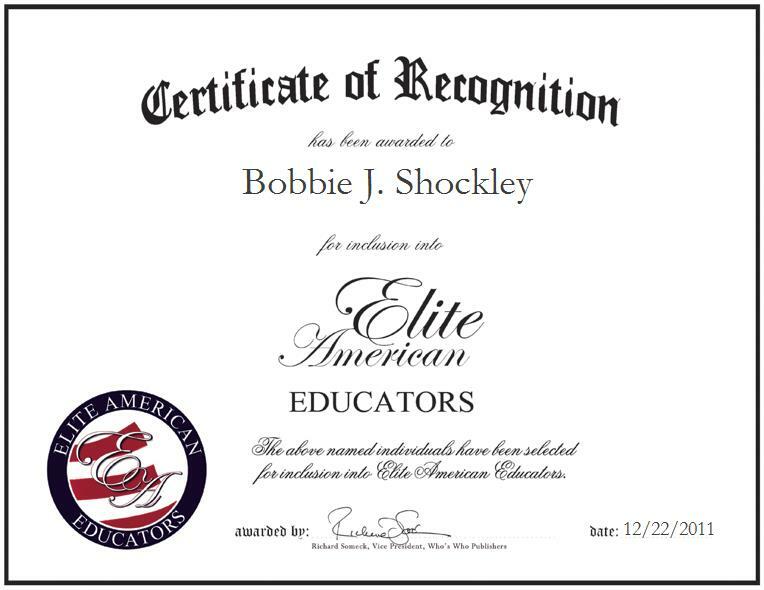 UPPER MARLBORO, MD, December 22, 2011, Bobbie J. Shockley, Coordinator of Biotechnology and Social Studies Teacher Coordinator at Largo High School, has been recognized by Elite American Educators for dedication, achievements, and leadership in academic program coordination. Over the course of an illustrious career that has spanned nearly four decades, Ms. Shockley has refined a sophisticated skill set in social studies. She is currently in charge of promoting the biotechnology program, which is a four year Science program designed for students that have expressed in interest in the field of medicine. She is also responsible for coordinating with social studies teachers, and serving as a liaison between members of the department. She acquires vital materials, meets with parents, performs preliminary budget work, and communicates with administrators and associates at the regional office. In utilizing the wealth of experience and knowledge that she has amassed, she monitors instruction, develops the school improvement plan, and also, organizes graduation programs. Ms. Shockley’s area of expertise is in social studies, organization and management. She is also a certified media specialist, and she holds an Advanced Professional Certificate and a number of accreditations which are focused on education, including official approval as an Administrator I and an Educational Media Associate. She is certified to teach Elementary Education 1-6 and middle school, history 7-9, social studies 7-9, reading 8, and special education. She also holds certifications in AP world history and AP human geography. Ms. Shockley was inspired by a long-standing love for working with and teaching children to pursue her current career path. In addition to the role that she currently fulfills as an educator, Ms. Shockley serves as a technical assistant at an Interactive Television Station. She supports a myriad of worthy causes, which include Asbury United Methodist Church in Washington, DC, and the Prince George’s County Warm Night’s program. She attributes her success to the opportunities she received to experience different avenues of education, her faith in God and the support she receives from her family and colleagues. In her spare time, she enjoys singing, reading, baking, traveling and shopping.